This is a colorful and simple salad with a high “wow” factor. 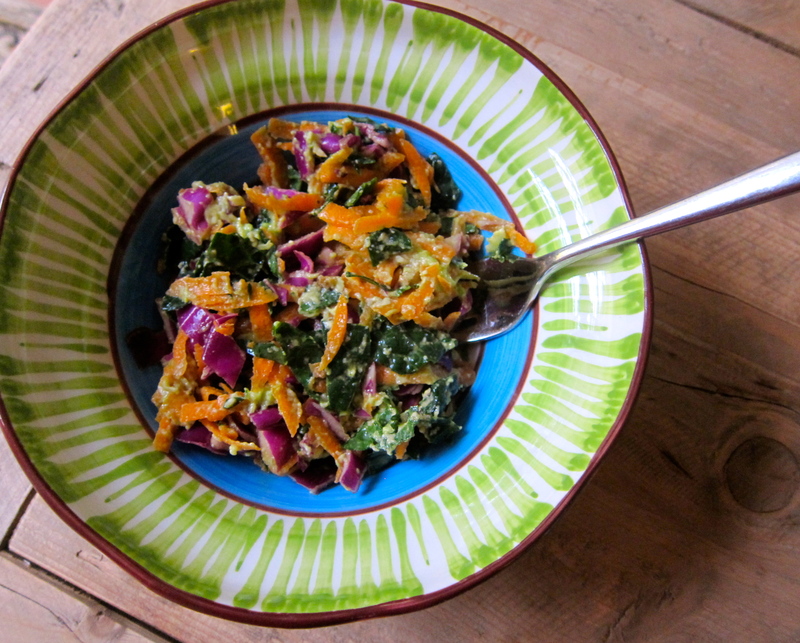 Julienne dinosaur kale, red cabbage and carrots (I use a hand grater to quickly grate the carrots,) mix with a splash of olive oil and the juice of one lemon. Add kosher salt. Slice an avocado over the top, mash it in and mix it all together. For added punch throw in some toasted sunflower seeds. The result is an incredibly tasty, highly colorful and very nutritious raw salad that will complement any meal. Or pair it with crusty, fresh baked bread for a light lunch. Kids actually love it, too! This hearty casserole melds contrasting textures and flavors in a heart-warming stew. 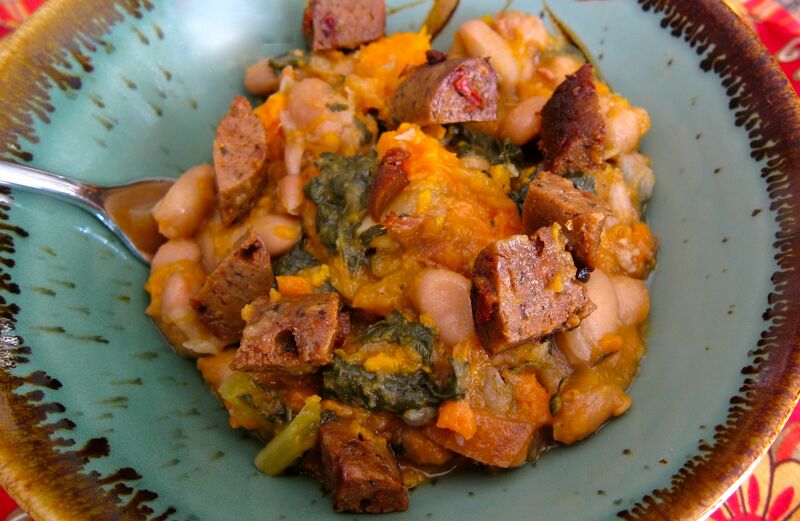 The beans add richness, the kale a slight bitterness, the sweet potato, well, sweetness! Somehow it all comes together, topped with veggie sausage, to create a rich and satisfying melt-in-your-mouth winter meal. 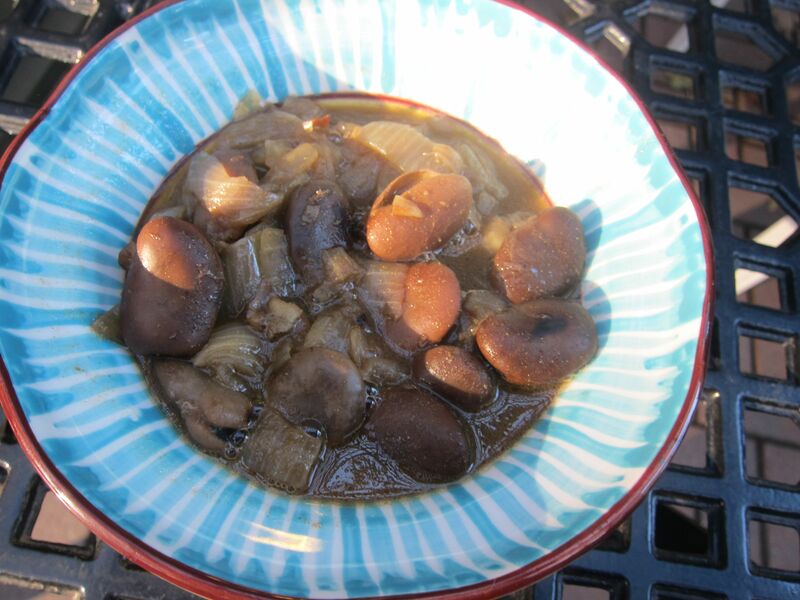 This was another slow-cooker experiment for me—and it worked beautifully cooking all day and filling the house with wonderful aromas—but it can also be done successfully in a dutch oven or large sauce pan at a slow simmer for 45 minutes. Either way, kale is added towards the end of cook-time, and sausage comes on post-pot. Slow-cooker method: Sauté the onions until translucent. Put in ceramic cooker pot. Add the bay leaf, thyme, carrots, parsnip, beans and sweet potato. Season with salt and pepper. Add one cup of water. Cover and cook on low for eight hours. During last half hour of cooking, stir in chopped kale. Slice the veggie sausage into small bite size chunks and light brown in frying pan. Dish your bowls of stew into serving dish, and put a sprinkling of sausage pieces on the top. If you are cooking stove-top, use 2 cups of water instead of one, simmer for half an hour. Add kale and cook for another 15 minutes. Serve as above. I doubled the recipe for my family of five, which gave us a good sized dinner with some fresh bread and salad on the side—and leftovers for lunches. This five ingredient (plus spices) wonder dish gets five stars from young and youthful alike in my house. I made it in my new slow-cooker, but it can also be cooked at low heat in a dutch oven for 40 minutes. 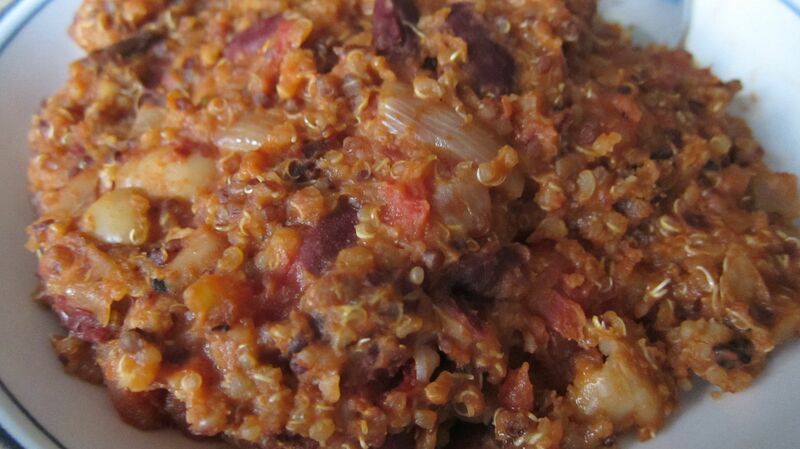 The slow cooker really melds the ingredients and brings out the spices, but it is also perfectly yummy stove-top. Perfect for coming home from school or work on a cold winter day. Salt and sauté the onions, then add all the other ingredients and combine. Cook on medium low heat for half an hour to 45 minutes, stirring occasionally. Or set it up in slow-cooker for 8 hours on low. Eat and be amazed – this unlikely-to-our palette combination of flavors really works! This is a last minute, no thrills, surprisingly quick and delicious dinner soup. The ingredients are all included in the picture! Take two cups of dried lentils and cover them with boiling water (I use water from our Insta-hot). Set aside and chop onion, garlic, carrots and celery. 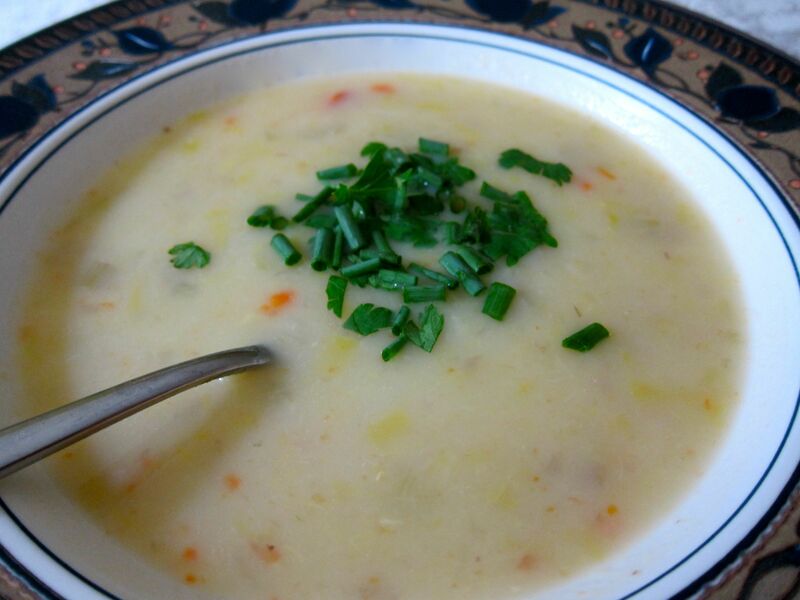 Sauté the vegetables in water (for fat-free soup—use tbs. oil if fat is not a concern) with bay leaf, salt, pepper, and cumin in a sauce pan or dutch oven while you chop up 3-4 good sized potatos (I used smaller ones because that is what I had in the house.) Add the potatoes when the onions are fragrant and translucent. Cover with water to 2 inches over the potatoes. Add the soaked lentils and 4 C of water. Soaking the lentils for the 10-15 minutes it takes to prepare the rest of the soup helps them get a head start on cooking, since they take a bit more time than the potatoes. Bring to a boil, lower to medium heat, and cook for 30 minutes or until lentils are soft. This soup can stay heated at low heat for a couple of hours and suffer no harm. Serve with fresh bread for a simple, hearty meal. 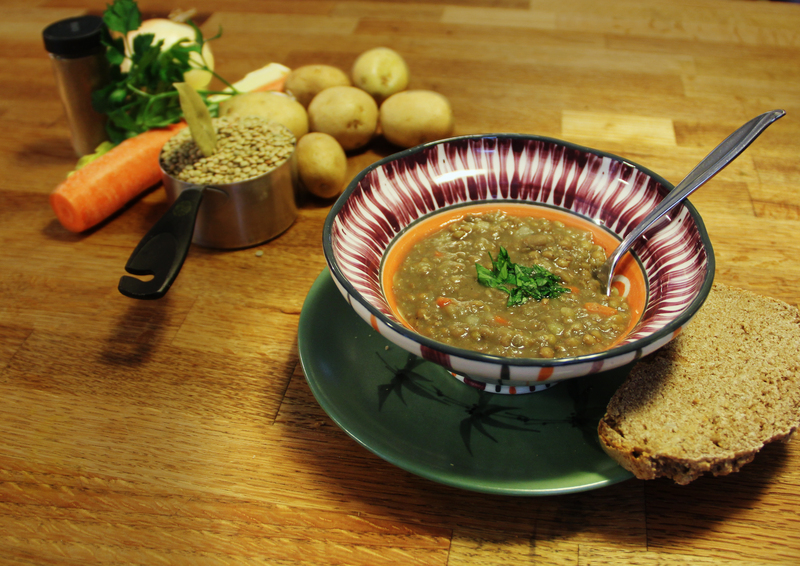 There is something about lentil soup that is homey, comforting and sustaining, and be prepared to ladle out seconds! Years ago we ate Logan Bread on an Outward Bound trip in the Florida Everglades. When planning our menu for a recent, week-long Appalachian Trail hike in Vermont, I tried different recipes over several weekends. Below is the recipe of the Logan bread our family agreed is the best. 2. mix all ingredients together very well and turn into a greased roasting pan. Bake one hour. 3. Cut into squares and then allow to air-dry until squares are semi-dry. 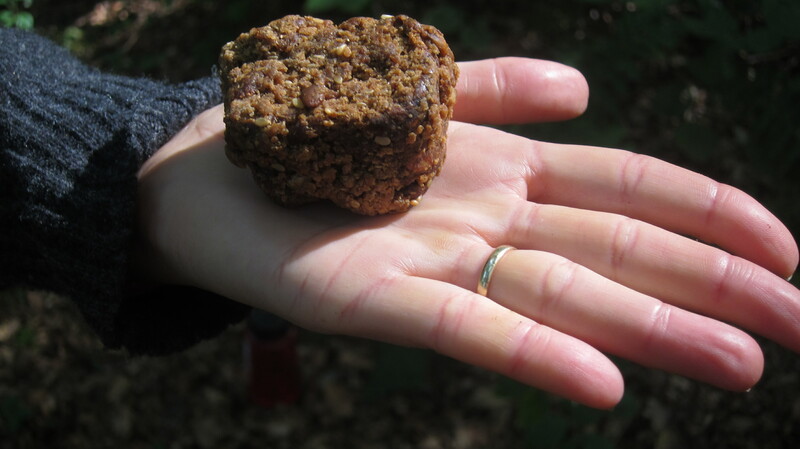 A square like the one in the picture contains 300 calories (!) and is absolutely delicious. This simple and delicious recipe evolved when I looked in my vegetable drawer and found two leeks, half a bunch of celery and a stub of a carrot. First I cleaned the leeks and chopped them finely, and put them into a pot with some olive oil and salt to saute. The celery was close to the heart of the bunch – the outer stalks had already been pulled off for other snacks and the upper half lobbed off for another soup, so what was left was the tenderest most flavorful part. I chopped it up right down to where the roots start, leaves and all, and added it to the leeks. I fine chopped the carrot stub, more for color than for taste and threw it in. When the vegetables had all softened, I added three cups of water to cover them and simmered for half an hour. With the soup blender I pureed the soup with 2 cups of rice milk. Seasoned with salt and pepper, and served with some fresh chives and parsley from my garden herb pots. My family loved this soup. The tender celery makes it very sweet and there are none of the harsh strings that outer celery stalks bring to a soup. The leeks contribute a more gentle flavor than onions. All together creating a soup that feels soft and gentle, and a delicious antidote to the heat of a hot summer night.